In February, 2006 I visited the Middle East, in particular Jordan and Egypt. I spent two weeks in Egypt. The trip was organized by Overseas Adventure Travel. 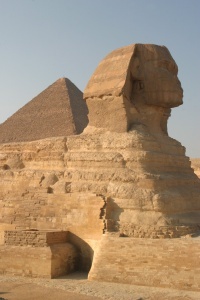 I was always fascinated by ancient Egypt and always wanted to visit these sites. It was everything that I hoped for and then some!! The Egypt part of the tour started in Cairo with visits to the Egyptian Museum. This is a fascinating museum with enormous amounts of ancient Egyptian relics. Some of the most famous parts are the pieces found in Tutankhamun's tomb, the only tomb of a Pharaoh that was found intact. All others had been robbed. Another note-worthy exhibit in that museum are the mummies of some of the Pharaohs. From Cairo we flew to Luxor. Luxor has a couple of very impressive temple complexes in the city. And then there are the Valley of the Kings and the Valley of the Queens with their tombs. The tombs are fantastic. They are lavishly decorated with paintings. The colors of these paintings are brilliant, 3500 years after they have been painted. The ancient Egyptians used almost exclusively mineral paints, produced by grinding up colored semi-precious stones. These mineral based paints last basically forever, whereas organic paints would be long gone. Unfortunately you are not allowed to take pictures in the tombs, so I can't show any of that. One morning we went on a hot air balloon ride. It was very scenic, we saw some of the monuments from the air. Hatshepsut's Temple was one monument that we did not visit, we only saw it from the balloon in the distance. From Luxor we took a cruise ship to Aswan on a three day trip. Being on a cruise ship is not really my cup of tea. I felt like I was in prison. I like to walk around and explore things, and you just can't do that on a ship. Entertainment activities like napkin folding and mummy wrapping just don't do it for me. But we did visit two very impressive temple complexes in Edfu and Kom Ombo during the cruise. In Aswan we visited the Great Aswan Dam that created Lake Nasser. It is an impressive dam. Its construction is quite different from other dams that I knew, for instance the Hoover Dam on the Colorado River in the western USA. Its profile has very shallow walls. The slope of the downstream wall is only about 15°. At the base the dam is almost 1,000 m (3,300 ft) wide. When the water behind the dam started rising, it began threatening many temples that had been built along the Nile by the ancient Egyptians. Over 20 of these were rescued by cutting them out of the rocks and moving them up and away from the water. The most famous of these is Abu Simbel, a temple built by Ramesses II. The rescue of this temple was big news in the late '60s, I remember it well. When I followed this rescue, I hoped to eventually see it myself. I took the short flight to Abu Simbel and visited that temple for a few hours, a long-held dream come true. It is mind boggling to see! Another temple that was rescued from the water is the Isis temple in Aswan, again a very interesting site. We went there a second time at night so see a sound and light show. It is quite touristy, but it did also give some factual information. The Nubian Monuments from Abu Simbel to Philae are a UNESCO World Heritage Site. From Aswan we flew back to Cairo to see the Pyramids. These Pyramids are HUGE. Memphis and its Necropolis, with the Great Pyramids, are a UNESCO World Heritage Site. The first man made object higher than the Pyramids was the Eiffel Tower, built in 1889. Until then the tallest man-made structure was the Great Pyramid in Giza. The Great Pyramid is also the only complete survivor of the Seven Wonders of the World. Of the other six only two can still be seen. I saw the Temple of Artemis in Ephesus during my visit to Turkey. Today only one column is left of this magnificent temple. The ruins of one of the others (Mausoleum of Maussollos at Halicarnassus) still can be seen in Turkey (I missed that one). The other four (Hanging Gardens of Semiramis, Statue of Zeus at Olympia, Colossus of Rhodes, Lighthouse of Alexandria) don't exist anymore. The three Great Pyramids in Giza are not the only Pyramids. In fact there are many dozens of them. Our tour brought us to the Step Pyramid in addition to the three Great Pyramids. In addition, seven of us got together and rented a taxi and drove to another set of Pyramids, the Bent Pyramid and the Red Pyramid (see Architecture). The tour in Egypt was very well organized. The only problem I had was getting to the Jordan part of the trip. OAT was not very helpful during this problematic time of my trip. Everything else during the trip worked out fine. The travelers with OAT are a bit older than they were for instance with Explore, but not as old as with Eldertreks. Like with Eldertreks, none of the travelers went out for a beer in the evening, everybody was in bed by 21:00. The tour guides were excellent. The guide responsible for my group was Ereen. She was excellent. She has a degree in Egyptology and was very knowledgeable. I am very interested in Ancient Egyptian Mythology, so I had thousands of questions. Ereen answered them all cheerfully and in as much detail as I wanted. A lot of the descriptions on these pages are due to input from Ereen. Thanks! One part that was not really good were the so-called "discovery" visits. These were really visits to commercial stores. All of these establishments were outrageously overpriced. You could find everything that they sold for much less money in regular stores. One aspect of the tour that was not at all to my liking was the timing. Everything is organized for people with much shorter attention span than mine. I needed much more time in the temples and museums. Having 30 minutes to explore a temple like the Temple of Horus in Edfu is pitiful. I ended up staying at a temple or museum alone to have more time to explore, and finding my own way back to the hotel. This happened several times. The other part that didn't fit me was the Nile cruise. I like to walk and explore for hours around town. That just doesn't happen on a ship. I never went on a cruise before, because I always suspected that I wouldn't like it. I was right and then some! One evening we were docked in port. I thought great, I'll go ashore exploring, but the guards wouldn't let me out of the docking area!! I really felt like I was in prison. The cruise ship tried to relieve the boredom by providing entertainment activities like napkin folding, playing musical chairs on seat cushions, and mummy wrapping (I am not kidding!). That of course didn't sit very well with me, it just rubbed in how much I was in prison, without any options. But there wasn't much in terms of trips that didn't have a Nile cruise as part of the trip. Since I didn't have any experience with a cruise before, I thought I could handle those three days. Boy was I wrong! Now I know that I have to avoid a cruise as much as possible. But don't get me wrong. For people who like this type of experience, it was great. The cruise ship crew did all they could to make it an interesting and pleasurable experience. Being on the Nile was fantastic, seeing the different types of surroundings, the birds, the boats, fishermen, etc. That part was very enjoyable for me as well. The others on the cruise seemed to have enjoyed it, even the children's games. One of them said "This is Life", while we were standing on the sun deck of the ship. The food in Egypt was pretty good, but not quite as tasty as in Jordan. You usually get an assortment of salad-style dishes first, then an assortment of main dishes with chicken, beef, and fish. The food is mostly buffet style. Deserts are usually very sweet. There are lots of fresh vegetables and salads, which is very much to my taste. I didn't eat much of the Egyptian food, not because I didn't like it, but because I liked it too much. I had to seriously curb myself, or you could have rolled me home at the end of the trip . The food on the ship was very plentiful, but not extremely good. Some of it was good, some of it just average. Nothing was very good, let alone excellent. There seem to be enough places where you can get alcohol. However, hotel bars are very expensive, and the bar on the ship was even more expensive than the expensive hotel bars. The prices on the ship are easily explained, you are in prison, so you don't have any choice, so they can take what they want. Behavior like that used to be called "Highway Robbery". I did find a couple of bars in Luxor. The beer there cost half of what it cost in the hotel bar. But bars are few and far between, most of the time I had to resort to the expensive hotel bar. The people in Egypt are very friendly. Unfortunately there are too many people trying to sell you something, so you never know whether somebody is just being friendly or is trying to hustle you. In order to discourage peddlers, I was usually very curt and non-responsive to anybody who started to talk with me, at least in tourist areas. Only when I was walking around the back streets did I relax in that respect. I had a lot of fun at one point in Luxor when a bunch of kids started mobbing me. They followed me, not to beg, but to have their pictures taken. One of them made a half-hearted attempt to ask for baksheesh, but the others actually stopped him. I took their pictures and showed them on the digital camera what it looked like. I had a lot of fun, and so did they. Other kids in the street often ask for "bonbon" (candy) or pens, sometimes also for baksheesh, but it is not really bad. One time, one of the hustlers started talking with me as if he just wanted to give me advice. He told me that he knew a part of the market that is really good, and that he knows very well (sure, that is where his buddy sells stuff!). He warned me that a lot of people that talk with me are really hustlers that only want to take advantage of me, and that I should be careful. He then told me how to say "go away" in Arabic. So of course I told him to "go away", since he obviously was a hustler. He got really upset, and told me that I was in his country and that I had no right to tell him to go away. That really had me stumped. He was of course right that I was in his country and that I should behave according to their customs. He really made me feel bad for a while. But on the other hand, he really was a hustler who tried to get me to his store in the market. After he left, another one came up to me and told me exactly the same story, from beginning to end. After thinking about it for a while, I came to the conclusion that I was more right than he was. He clearly was a hustler and I think I had the right to tell him to go away. The temples were everything I had hoped and wished for and much more! Mind boggling doesn't do it justice in my opinion. Seeing these carvings and paintings, some of them over 4,000 years old is just incredible. More in the section Architecture. The museums are of very different quality. The Egyptian Museum in Cairo is immense. It has a huge number of artifacts. But it is an old museum, and many of the artifacts are not marked very well and not displayed very well. But the huge quantity of astonishing artifacts makes up for that. The most astonishing artifacts are of course the burial gifts of Tutankhamun's tomb. He was a fairly minor Pharaoh, as far as Pharaohs are concerned, and he died young, so he didn't have time to accumulate all the treasures. His claim to fame is that his tomb was the only royal tomb that was not plundered. The treasures in that tomb were amazing. Imagine what it was like in the tomb of a major Pharaoh. I was in hog heaven in that museum. I spent about six hours in there, and that was not nearly enough. The museum in Luxor was much smaller, but much better displayed. It has some astonishing stone sculptures. The museum in Aswan is also small, but very nicely displayed. Unfortunately you are not allowed to take pictures in the museum in Cairo. I did take pictures in the museum in Aswan, unfortunately you can't use a flash, so that limited what I could do. In order to stay that long in the museum in Cairo, I split from the tour and stayed on my own. This meant I had to take a taxi back to the hotel. I had taken a business card from the hotel so I could show it to a taxi driver to get back. That didn't work out so well at all! The card was in English, and the taxi drivers don't speak or read English! The first one gave up and drove away when he realized that we couldn't communicate. The second one was smarter. After some haggling, he agreed on a price, without knowing where he would be going. I had asked in the hotel what the ride should cost, and our price was less than the limit that they told me at the hotel, so I was OK as far as the price was concerned. The taxi driver drove down the street and stopped a couple of blocks later. He took the card and went to a man standing next to a restaurant, asking what this address was. That man didn't know it either, so they got somebody else from the restaurant. That man finally knew the hotel and told my taxi driver. This taught me a lesson; from then on I always asked the hotel to write down the name and address in Arabic on the cards that I got. There are lots of websites that have information about ancient Egypt. I have linked to some from my page about Pharaohs. 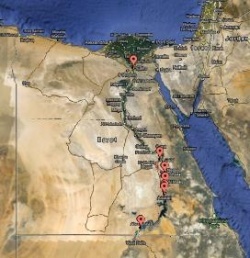 A good collection of links to Egypt websites is at Websites on Ancient Egypt. I have organized my pictures in several pages.